8.30 – 9 AM Company Parade. 9.00 – 12 PM Examination of Platoons by the Commanding Officer and 2nd In Command.Counter Attack Practice – Assault and Defense – Grenade Practice and Range Firing.Special Class in Bayonet Fighting for all Sergeants. Special Instruction for Scouts – under Battalion Scout Officer. 9.00 – 12 PM Platoon & Company Drill – Assault Practice –Examination of Platoons by the Commanding Officer and 2nd In Command. Grenade Practice – Clearing Trenches – Range Firing and Formations. 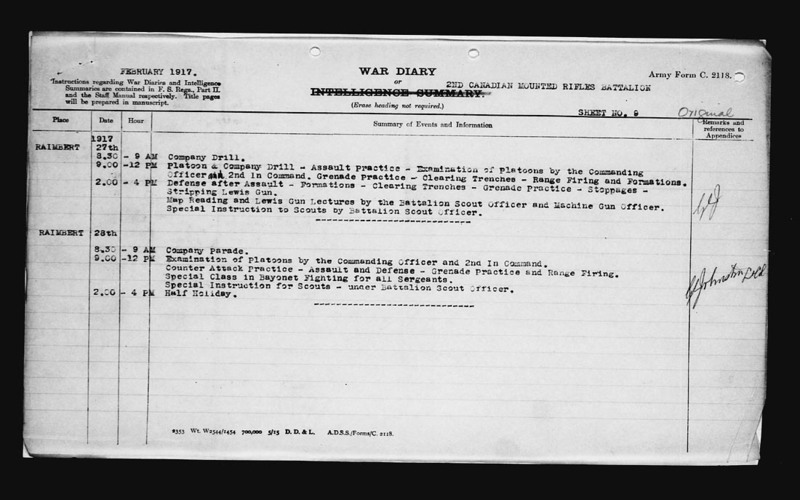 2.00 – 4 PM Defense after Assault – Formations – Clearing Trenches – Grenade Practice – Stoppages – Stripping Lewis Gun.Map Reading and Lewis Gun Lectures by the Battalion Scout Officer and the Machine Gun Officer. Special Instruction to Scouts by Battalion Scout Officer. 9.00 – 12.00 Platoon and Company Drill – Assault Practice – Formations – Assault –Examination of Platoons by the Commanding Officer and 2nd In Command. 2.00 – 4.00 Extended Order – Formations and Assault – Grenade Practice – Lewis Gunnery – Stoppages – Range Firing. Map Reading and Lewis Gun Lectures to N.C.O’s. Special Instruction under Battalion Scout Officer. 9.30 – 12 Company and Platoon Drill – Range Firing Assault – Formation Drill – Assault Practice –Box Respirator Drill. Special instruction to Scouts by Battalion Scout Officer. 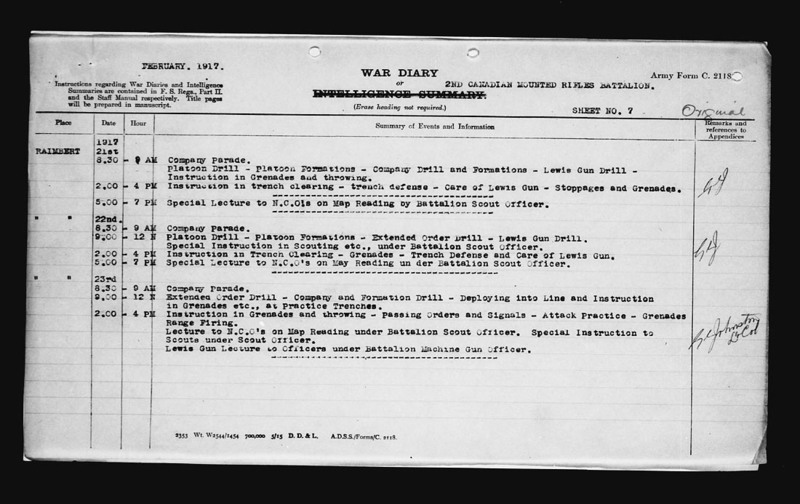 2.00 – 4 PM Grenade Practice at Practice Trenches – Extended order drill – Passing orders and signals.Lecture to N.C.O’s on Map Reading under Battalion Scout Officer. 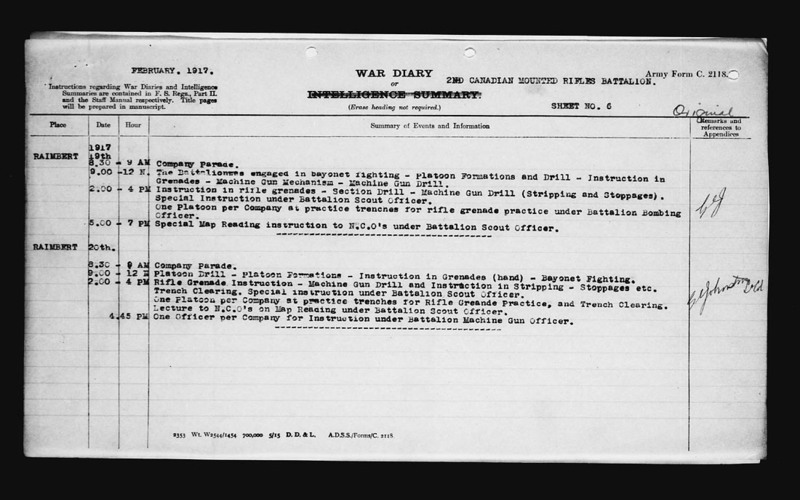 Instruction in Lewis Gunnery – Stoppages – Stripping etc. The Corps, Divisional and Brigade Commanders witnessed practice operations of this Battalion, and expressed their great satisfaction in the way they were performed and were much impressed with the progress attained in the new training. 9.00 – 12N Extended Order Drill – Company and Formation Drill – Deploying into Line and Instruction in Grenades etc., at Practice Trenches. 2.00 – 4 PM Instruction in Grenades and throwing – Passing Orders and Signals – Attack Practice – Grenades Range Firing. Lecture to N.C.O’s on Map Reading under Battalion Scout Officer. Special Instruction to Scouts under Scout Officer. Lewis Gun Lecture to Officers under Battalion Machine Gun Officer. 9.00 – 12N Platoon Drill – Platoon Formations – Extended Order Drill – Lewis Gun Drill. Special Instruction in Scouting etc., under Battalion Scout Officer. 2.00 – 4 PM Instruction in Trench Clearing – Grenades – Trench Defense and Care of Lewis Gun. 5.00 – 7 PM Special Lecture to N.C.O’s on May Reading un der Battalion Scout Officer. 8.30 – 9 AM Company Parade.Platoon Drill – Platoon Formations – Company Drill and Formations – Lewis Gun Drill – Instruction in Grenades and throwing. 2.00 – 4 PM Instruction in trench clearing – trench defense – Care of Lewis Gun – Stoppages and Grenades. 5.00 – 7 PM Special Lecture to N.C.O’s on Map Reading by Battalion Scout Officer. 9.00 – 12 N. Platoon Drill – Platoon Formations – Instruction in Grenades (hand) – Bayonet Fighting. 2.00 – 4 PM Rifle Grenade Instruction – Machine Gun Drill and Instruction in Stripping – Stoppages etc. Trench Clearing. Special instruction under Battalion Scout Officer. One Platoon per Company at practice trenches for Rifle Greande Practice, and Trench Clearing. Lecture to N.C.O’s on Map Reading under Battalion Scout Officer. 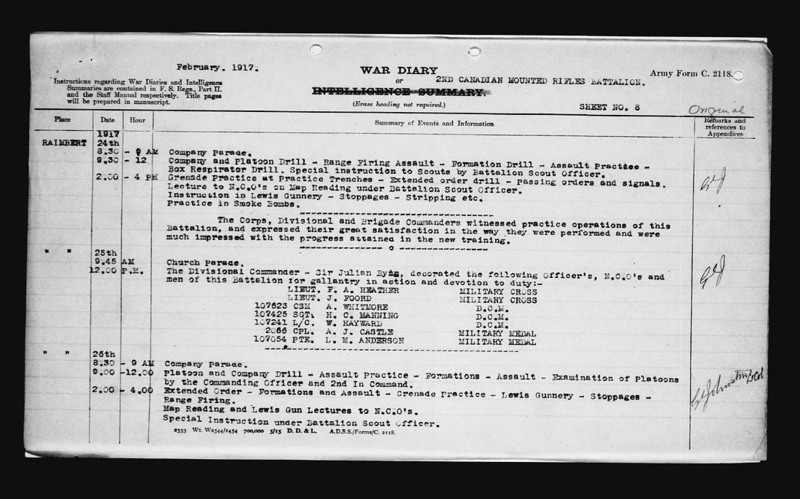 4.45 PM One Officer per Company for Instruction under Battalion Machine Gun Officer. 9.00– 12 N. The Battalionwas engaged in bayonet fighting – Platoon Formations and Drill – Instruction in Grenades – Machine Gun Mechanism – Machine Gun Drill. 2.00 – 4 PM Instruction in rifle grenades – Section Drill – Machine Gun Drill (Stripping and Stoppages).Special Instruction under Battalion Scout Officer. One Platoon per Company at practice trenches for rifle grenade practice under Battalion Bombing Officer. 5.00 – 7 PM Special Map Reading instruction to N.C.O’s under Battalion Scout Officer.